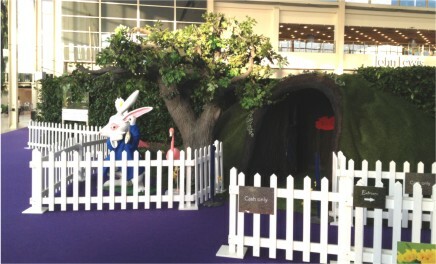 Fungo Ltd (now incorporated into mazescape) were asked to design, install and run a new Easter maze event for thecentre:mk, and owners CBRE. This was the first of a new seasonal event that would join the successful Summer Beach and Christmas as part of their regular events calendar. Fungo commissioned Mazescape to design this exciting new event. The Brief – Mazescape were asked to design an attraction that would be unique, compelling and offer a range of activity for a broad spectrum of ages and visitor profiles. The attraction was to fill Middleton Hall, an indoor exhibition space with a clear span of 42m x 60m. The space is bordered by retail units including John Lewis, whose restaurant overlooks the area, so the attraction needed to look good from above as well as on the exhibition floor. Installation was to be completed within four days and all materials were to be delivered out of hours. The exhibition space has a polished marble tiled floor beneath carpet and no fixings could be made into it. The duration of the event would be four weeks and it was to meet all applicable DDA standards for accessibility and playability. The success of the event was to be judged by the increase in footfall for the period. A small entry fee was to be charged to offset some of the cost. 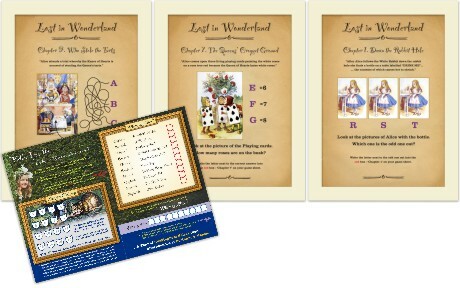 Theme – ‘Lost in Wonderland’ was developed as an Alice in Wonderland adventure, incorporating two games based on key scenes from the Lewis Carol book giving rise to six distinct areas for visitors to navigate through and play. Down the Rabbit Hole – The entrance was designed as a giant rabbit hole in a grassy mound that incorporated a till and storage of AV equipment. The structure was sectional to allow fast construction on-site and themed with a giant oak tree, White Rabbit character and seasonal flowers. 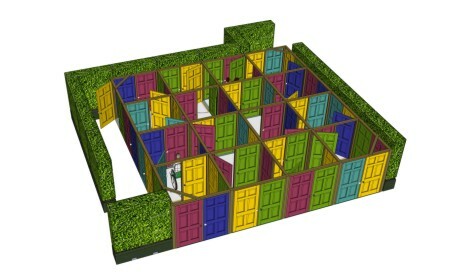 Doorz Maze – Upon exiting the rabbit hole, visitors found themselves inside a room surrounded by eight colourful doors. Only one of these doors would open and lead them into the next room of eight doors identical to the first. Some rooms included door bells and cryptic signage, with one door being smaller than the others and concealing a clue. Living Hedge Maze – Visitors exited the Doorz Maze to find themselves inside a real living hedge maze supplied by Rentahedge. The contrast to the experience of the Doorz Maze was marked and although not a large maze, was surprisingly confusing, allowing us to hide a number of clues for the two main games. Oversized props enhanced the theme and eventually a large looking-glass gateway allowed visitors to enter the ‘Timbamaze’. The living hedge planters were quickly and professionally installed, instantly creating a real sense of wonder due to their size and the fact it was a living structure inside a shopping centre. Timbamaze – Is a modular freestanding maze structure of timber picket panels and archways. Oversized garden props and climbing roses give a garden like feel to the space. The Timbamaze added a denser network of pathways to the maze puzzle, allowing us to locate a number of quiz clues and games within this part of the structure. Card Soldiers Maze – Upon leaving the Timbamaze, visitors found themselves within a courtyard surrounded by large playing card soldiers. 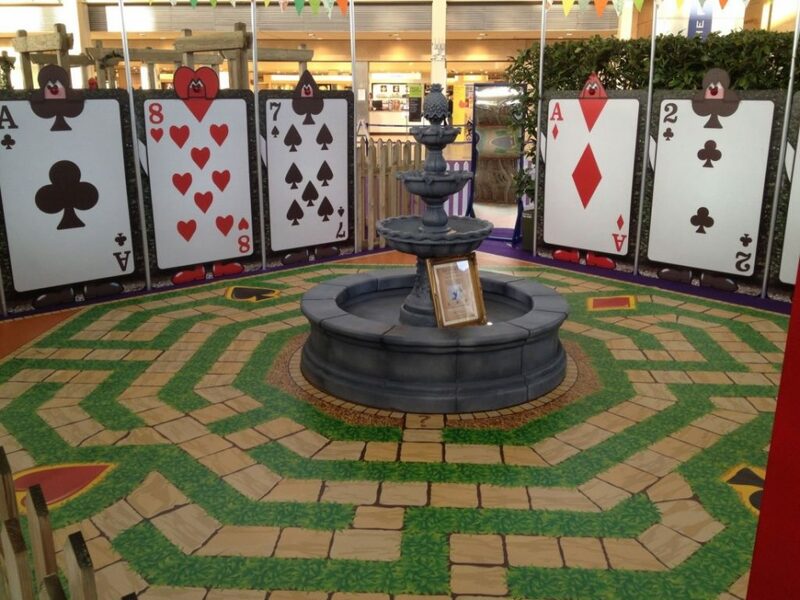 The floor was decorated with a large 8m x 8m Stomp Puzzle a printed floor maze around a central fountain prop. The maze incorporated pressure pads beneath a number of card suit symbols. These illuminated the noses of the standing card soldiers when stood upon, this was a very popular feature with children. 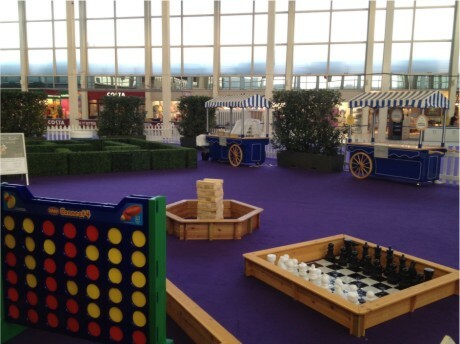 The final area was a combination of play and retail featuring garden games, a mini artificial hedge maze, craft area and chocolate/sweets handcart. Results – The event was regarded as very successful and surpassed the clients expectations in terms of physical appearance and game play. Projected figures for entry were met by the end of the first week and consequently the gate receipts were significantly higher than anticipated. Lost in Wonderland exceeded all expectations in terms of customer visits, income generation, frequency of visits, incremental footfall and retailer engagement. One third of centre footfall visited Middleton Hall, the home of the Lost in Wonderland maze, over the four weeks the event ran. The maze achieved ticket sales of over £28,000, 100% up on projected event income. The number of guests in the event was 16,962, up 102%, and a total of 589,537 customers visited Middleton Hall, up 22% year on year. Dwell time for the centre increased 3.3% year on year, and an average of 23% of guests stayed longer than 120 minutes. thecentre:mk succeeded in reaching 5,091 competition entries, the highest number of competition entries reached through branded events. Media value of £50,000 was generated through TV and press coverage, together with online media/web videos. Retailer engagement throughout the duration of the maze featured John Lewis, Whittard of Chelsea, Thorntons and Hotel Chocolat, focused on selling products and raising brand awareness. All of these stores posted increased trading. Hotel Chocolat, who used sales promotion to send guests in store, saw 1700 redemptions across the weekend, and their busiest day ever in store, up 49% year on year. As a result of their presence at the event, and for the first time ever, Thorntons sold out of Easter eggs. In addition, the restaurants/coffee shops sector saw year on year increases of 16.2%, with tenants including Giraffe and Nando’s posting double digit growth. John Lewis ‘The Place To Eat’ restaurant recorded sales so high they required additional staff, attributing this directly to increased footfall from Lost in Wonderland event. The specialist sector recorded like for like growth of 6.1%. 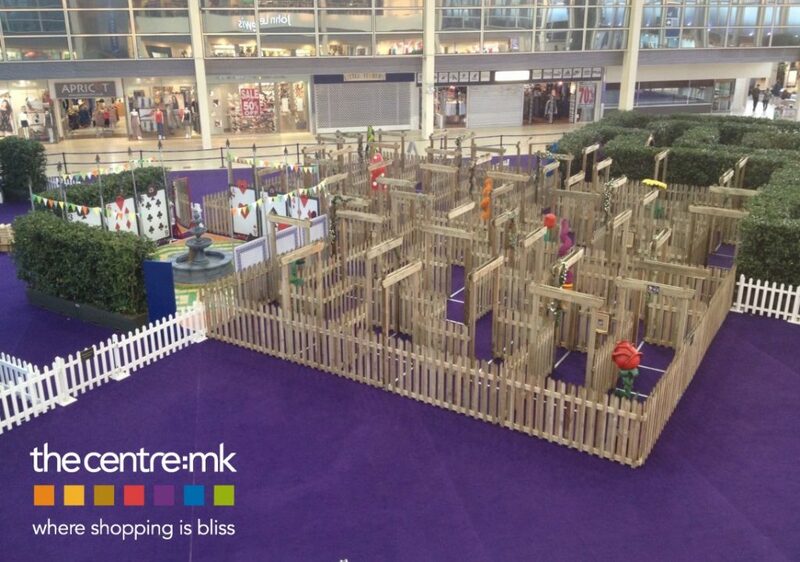 John Lewis utilised the maze for a team building event, resulting in tremendous feedback from the Managing Director. The Maze achieved ticket sales of £28,000, 100% above forecast. Guests visiting the event were 16,962 and increase of 102% yoy. Footfall into Middleton Hall increased 22% yoy. Dwell time increased 3.3% yoy. Editorial Value was independently audited and supported a roi of £50,000 across mainstream and digital media. 5000+ additional email addresses were captured.